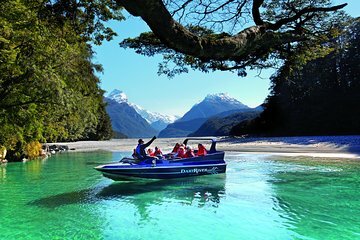 A jet-boat ride, a guided nature walk and a backcountry off-road tour are the highlights of this Dart River wilderness safari from Queenstown. During this 6-hour tour with a naturalist guide, venture into Glenorchy, gateway to the World Heritage–listed Mt Aspiring National Park. Surrounded by awe-inspiring peaks and hidden valleys, you’ll twist and turn down the glacier-fed Dart River. Finish with a leisurely walk through an ancient forest to learn about the wildlife and the area’s original Maori inhabitants. Comece o seu safári no deserto Dart River de 6 horas com traslado do hotel em Queenstown. Ouça comentários esclarecedores sobre as paisagens vivas enquanto seu guia fornece comentários durante a jornada de 45 quilômetros até Glenorchy, uma cidadezinha situada no limite do Parque Nacional Mt Aspiring, listado pela UNESCO. Esta área de excepcional beleza natural tem sido destaque em filmes como O Senhor dos Anéis e As Crônicas de Nárnia: Príncipe Caspian. De Glenorchy, partiu em um emocionante passeio de lancha pelo rio Dart. Segure firme enquanto o barco gira e gira em alta velocidade. Seu motorista manobra habilmente o barco a jato através de canais rasos e aponta pontos de referência naturais ao longo do sistema fluvial alimentado por geleiras. De volta ao chão firme, caminhe calmamente por uma floresta antiga. Seu guia naturalista destaca a flora e a fauna nativa da região e compartilha histórias cativantes dos habitantes indígenas maori e pioneiros da região. Depois, viaje ao longo de uma rota backcountry para uma aventura off-road através de mais paisagens da Ilha do Sul da Nova Zelândia, seguidas por uma relaxante viagem de volta a Queenstown. The Dart River Jet boat ride is absolutely amazing. the scenery is awesome , the information and expertise provided by the boat driver was fantastic and the speed and manouverability of the boat exhilarating. This is a must do exercise when in Queeestown, Everyone came off the boat with very smiley faces. The jet boat ride gets 5 stars - our jet boat guide, Liam, was super! Amazing ride on the river, with lots of thrills. The wilderness walk was nice, but nothing special. I think the walk could have been more entertaining and educational. Fantastic jet boat ride, and forest walk. Lovely views, well organised. The river ride was fantastic. It was so much fun. The only down side was the down time while you waited for the different buses to take you to different places. Especially the 40 minutes at the end waiting in the building for the bus to return to Queenstown. This was better than I expected. I would've love to do it again. Definitely a must do if you're in Queenstown. Breath-taking views and the most fun you'll ever have!!! I give it 10 stars and I'm not an easy person to please, so take it from me!!!! Outstanding - driver was on time and professional, and boat ride was thrilling. 100 satisfied! 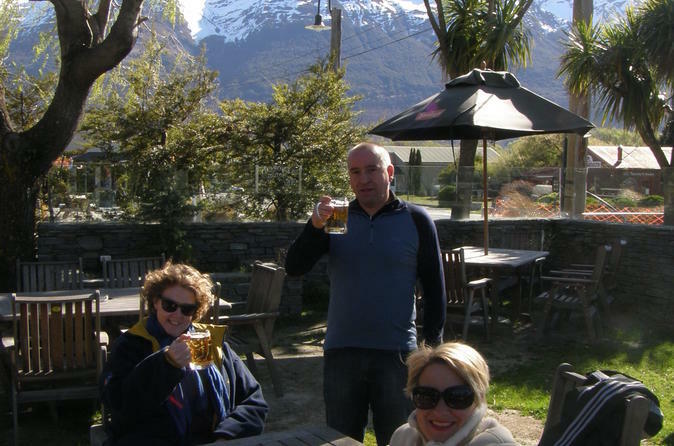 The trip was very well organised, right from picking us up at our hotel in Queenstown to returning us later in the day.  All the staff were very friendly and helpful. The highlight for me was the jet boat experience. It was fantastic and I would recommend this trip to anyone thinking of visiting this breathtaking area of New Zealand. Jet boat ride was fab, even in the rain. Elliot was passionate about his surroundings and shared it with us. Well organised and prompt pick up. Absolutely stunning scenery and exhilarating ride on the river! The walk through the beech forest was lovely and informative and the forest toilet much appreciated. Loved the giant chair! Great spin up the dart river - and knowledge of the woods was really good . Yeah may try the kayaks next for more in depth adventure.